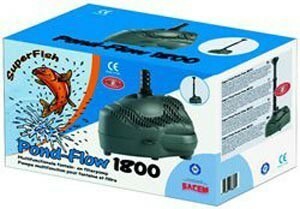 Superfish Pond Flow 1800 UK. Multi fuctional pump for fountains and filters. Includes a multi-step hose fitting and two different spray heads: a fountain nozzle and a water-bubble head. Economical to use,low power consumption. Comes complete with a 10 metre power cable and user guide.